Installment two of my vacation blog. After our two days in the beautiful Adirondacks, we headed due west toward Thousand Islands Park. Donna had arranged for a two day stay at a friends' vacation home in the park with 5 of her college friends and a few kids. All together there were 13 of us in a beautiful 4 bedroom home. The TIP (Thousand Island Park) settlement was developed at the turn of the century and I must say that when we got there I felt that we had gone in a time machine back to the turn of the century. The houses are (for the most part) meticulously maintained. The roads are for the most part gravel, which is fine, because most people get around by biking, walking or golf cart. It was surreal. Everyone was courteous and seemed carefree. I was telling Donna that I kept expecting to run into Katherine Hepburn or Humphrey Bogart or something. Even the stores were surreal. The supermarket just had a sign that read "Grocery". Another read "Ice Cream Parlor," and still another read "Realty." I seriously think the world would be a better place with such simple choices. Why do we need 6 different kinds of grocery stores selling 42 different kinds of hand soap? It would be better if we had one store with 3 kinds of soap. Less to clutter our minds to be used for more important pursuits. We spent the first night catching up with old friends over dinner and a couple beers. It was SO nice to sit and chat for hours on end with friends we haven't seen in 15+ years. We felt like we'd never lost touch. Picked right up where we'd left off 15 years ago. Good friends are like that. I know, because I have a few of my own from college. These are people you just mesh with and are comfortable from the start. No one puts on airs. There was no discussion of politics (which I loathe talking about with any friends). Just catching up with where each of us is at in life. Some reminiscing, but not too much. We also went down to the Ice Cream Parlor that had a wireless hot spot and skyped with a college friend who's now living in England. It was technology at it's finest, even though we lost video after 10 minutes and had to work with just audio. Another good friend that we picked right up with. The rest of the weekend was filled with swimming, tubing and even included a couple of firsts; Sarah and Ben both knee boarded behind Rich's 70 HP boat! They did extremely well and I was very proud when they both got up on their first try. They had a blast and want to do it again sometime. Their spirits are beginning to get a bit more adventurous, and that's a good thing. 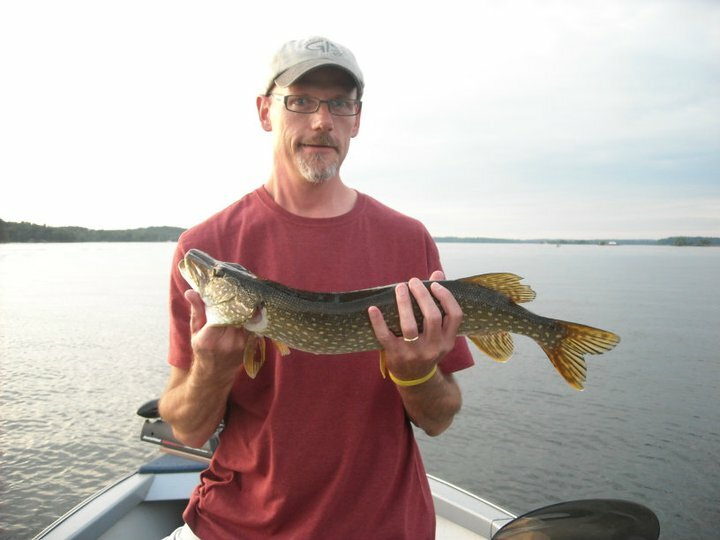 Rich and I got out fishing for 4 hours on Thursday night and landed about a dozen northern pike. Most were in the 17-20 inch range, but I did manage to get a 25" in the boat after I'd dragged it out of the weeds it dove for once it was hooked. Fun stuff and the perfect end to a perfect vacation. The whole two days reminded me of how important it is to enjoy your time with people you love. No one was overly attached to their phone or electronic leashes too much, we just sat and talked and laughed. I was determined to just enjoy the moment all along the way, and did just that. I have a new respect for the fact that I may never see some of these people again, so I was going to make the best of every moment.